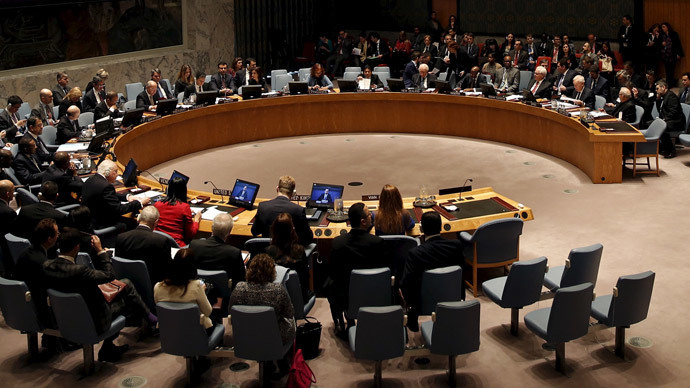 The UN Security Council is set to vote on a resolution drafted by Gulf Arab states seeking to impose an arms embargo on Yemeni rebels. Russia earlier suggested an all-inclusive ban on arms sales and to push all sides to the negotiations table. The draft resolution being put to the vote on Tuesday envisions an asset freeze and a travel ban on Ahmed Saleh, the former head of Yemen’s elite Republican Guard, and on Abdulmalik al-Houthi, a top leader of the Houthi rebel group, alongside several other top figures challenging Yemeni president’s rule, according to a Reuters diplomatic source. All targeted individuals, as well as “those acting on their behalf or at their direction in Yemen,” will be slapped with an arms embargo according to the measure put forward by Jordan and its Gulf allies. The resolution calls on Yemen’s neighbors to inspect all shipments into the country. But most of all it demands that the Houthis surrender and withdraw from lands they seized, including the capital. The Jordanian draft resolution is being debated alongside a separate Russian draft which calls for a “humanitarian pause” in airstrikes by a Saudi-led military coalition. An all-inclusive arms embargo on all parties in the Yemeni conflict, suggested earlier by Russia as an amendment to the Arab draft, has been rejected. A coalition of Arab states, led by Saudi Arabia, has been engaging Houthi militias from the air for weeks now, after the Yemeni President Abd Rabbuh Mansur Hadi was forced to flee the country and asked for an international intervention to reinstate his rule. According to a recent Red Cross report, over 1,000 people have died in the fighting on the ground and airstrikes, many of them civilians. Tens of thousands of Yemenis have been forced to flee their homes, while foreigners caught in the conflict are struggling to find ways of evacuation from the war-torn country. Meanwhile Russia continues to carry out international evacuations from Yemen. More than 300 people were evacuated from the Yemeni capital of Sanaa on two Russian flights on Sunday, and another 300 people were taken from the port of Aden to Djibouti by a Russian vessel. According to the Russian Embassy in Djibouti, 18 US citizens and six UK citizens, including children and toddlers, were aboard the ship. The escalation of hostilities and mounting chaos in Yemen have provided Al-Qaeda with an opportunity to strengthen the extremist organization’s presence there. Already one of the poorest countries in the Arab world, Yemen has a gloomy prospect of becoming not only “another Somali” but a full-scale “pirate state,” warned the head of Russia’s State Security Council, Nikolay Patrushev. The Saudi-led coalition had never been sanctioned by the Security Council but had started its air campaign with consent from Washington, Patrushev told Izvestia newspaper, noticing double standards in US and European reactions to the conflict. “An analogy suggests itself with the situation in Ukraine, where the legally elected President Viktor Yanukovich was also forced to flee, first Kiev and then the country,” Patrushev said. In Ukraine’s case the international community did not call for a military intervention to reinstate Yanukovich’s rule, but immediately declared he lost his legitimacy, he noted. “I would like to emphasize clear double standards, which the United States alongside the allegedly ‘progressive’ public traditionally apply to assess similar events,” Patrushev added. Amid the power vacuum, Iran called on Monday for the formation of a new Yemeni government. “I had the privilege of participating in the Bonn Conference when we created the Afghan government. Actually we didn’t do it, the Afghans did ...we can do that in Yemen too,” Iranian Foreign Minister Mohammad Javad Zarif said. Accused of covertly aiding and supporting Shiite rebels, Tehran insists it has given no military support to the Houthis. Instead Iran calls for an end to the Saudi-led air strikes crippling the country’s infrastructure and killing civilians. “Bridges are being bombarded, factories are being bombarded, hospitals; that can only entrench animosity. So we need to put an end to this,” Zarif said.